5-foot-tall portable area light with 58-degree beam. Rechargeable & AC/DC-compatible. Magnets for hands-free illumination. Compact, durable, & long-lasting. What Makes a Good Work Light? A work light's power source includes your light's power supply as well as the type of battery utilized. Corded work lights provide continuous illumination; however, cordless work lights, also known as battery-operated work lights, are smaller and easier to transport. If your job takes you to different locations each day, a battery-operated light is the right choice. For best results, we recommend using a portable work light with a Lithium-ion battery, as this chemistry weighs less, it lasts longer and is more stable. If cost is an important factor, Lead Acid batteries are a satisfactory second choice to Lithium-ion. What about generator-based lights? Cordless work lights are safer to use and are more flexible, when it comes to placement. Additionally, battery-powered RALS are quiet, do not require the use of flammable fuel, have lower heat signatures and eliminate any exhaust fumes. When dealing with handheld or smaller-sized work lights, the team at BatteryJunction recommends utilizing Li-ion or Nickel Metal Hydride (NiMH) batteries. NiMH batteries offer a long lifespan and are more stable than NiCd, therefore making them reliable second choice to Lithium-ion. Alkaline-powered work lights, while convenient, are not as cost effective. What makes LED light bulbs better than CFL, incandescent and halogen bulbs? For starters, LED lights are more cost-effective and energy-efficient - lasting five times longer than CFL (compact fluorescent light) bulbs. CFL bulbs are bright; however, they give off a green hue that may have a negative effect on your workspace. This is certainly something to consider when dealing with colors and during inspections. Incandescent bulbs are typically found in the cheaper work lights, which are typically corded and therefore not very portable. Lastly, halogen bulbs, while incredibly bright, produce quite a bit of heat that may be a fire hazard in some areas. In addition to the light bulb, it is important to understand the beam output of your lamps. COB (chips on board) light rails, for example feature a cluster of diode chips positioned strategically within one module to generate an intensely bright light. COB lights are extremely popular and do not require a lot of maintenance. 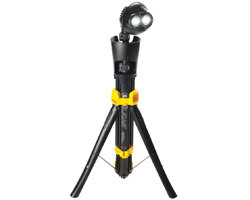 We chose the tripod stand as the best-designed work light because of its adjustable design and height. This gives you the ability to illuminate a broader area. Typically these RALs feature a pivoting head, which enables you to direct the output towards your working field. Portable work lights are also available in a hanging design. Due to the hanging design, these lights, though typically smaller, can still illuminate a larger area because of the higher elevation. 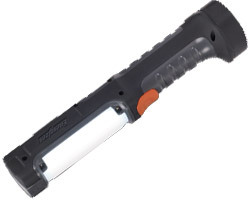 For more up-close work, a flashlight with a magnetic base is an alternative option that may work for your needs. Mechanics, for example, may choose to attach the magnetic tailcap of a light to the hood of car, for a more concentrated output. Whether you are an experienced professional looking to enhance or elongate your workday, or you are a part-time tinkerer at home, finding the right work light for the task at hand is crucial to your success. To recap, it is important to choose a lamp that offers a broad flood beam and a base or attachment system that is compatible with your environment. Browse through our collection of portable work lights to find the right one for your needs. Have questions or need help? Please do not hesitate to contact one of our product experts through our Live Chat system or by phone.